If you love chocolate or even if you are planning on buying someone chocolate then you need to read this. 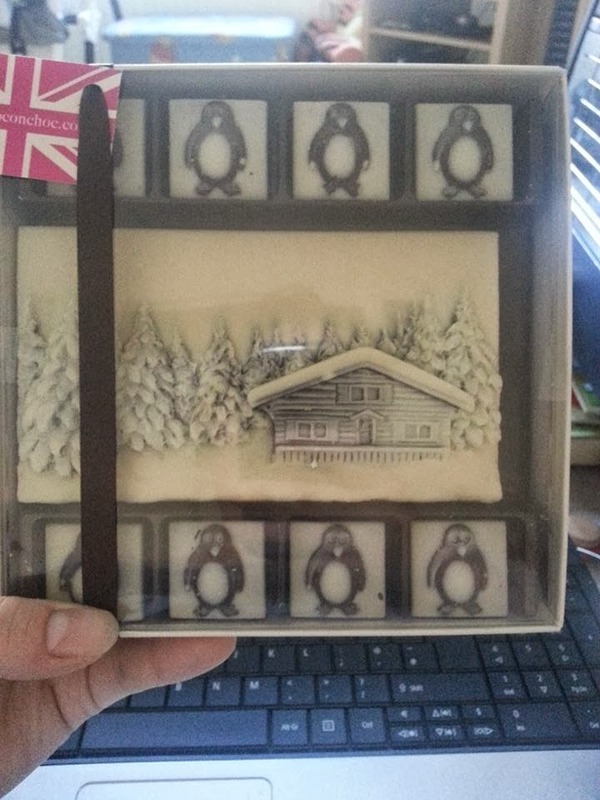 I was lucky enough to be sent some chocolate from a company called choc-on-choc. I came across this company from another website while browsing for some Chocolates to get people this Christmas. WOW was my first thought the pictures of the chocolate were great, I never thought chocolate could look so beautiful. When I found these I instantly showed my mum and of course Liam hinting that I wanted this!! 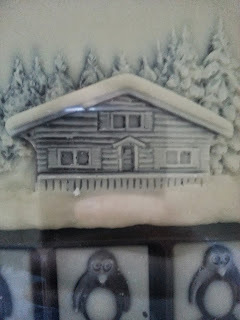 I contacted the company and told that I loved the detail on their products and would love to share with my blog readers. So here we are. I was sent this box of which is a selection of truffles. 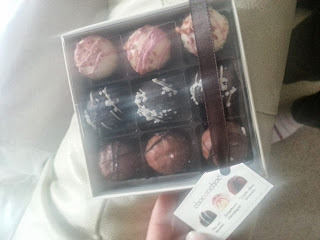 The flavours are Strawberry champagne, Triple choc brownie and Sea salt caramel. I'm not normally a huge fan of champagne or alcohol type chocolates because it's normally to strong, but these I could eat all day. I think the chocolate to champagne ratio is spot on. They were all very nice and I had the whole panel try them. Trinity had Sea salt caramel and I halved one with Liam as Molly had the other one. Liam had two of the brownie flavour I had the last one and me and my Mum had the Strawberry champagne ones. Yes sadly they are all gone but I will be ordering more. This is the second item I was sent. How beautiful is that?! I haven't eaten it yet and I can't bring myself to eat yet. I'm no art expert but surely this is some sort of food art. The detail is fantastic. Here is a closer look at the detail put into this chocolate. Please take a look at the work they do. You can find them on facebook just click here. On their website you will find a huge selection there is something for everyone. Dinosaurs for little boys, Flowers and truffles for your little girl. Many can be personalised by adding a name which I love as I can never find Jared-David wrote on anything. If you are planning a wedding are stuck on what favours to buy then pop on their website www.choconchoc.co.uk and have a look at the wedding favours they have to offer. Now your probably thinking that for such pretty looking chocolates it's going to cost a fortune, well you are wrong. The box of Truffles I was sent sell on their website for £8 that is less then a £1 for one compared to other retailers who's names I don't think I need to mention this is a great and fare price. The Snow scene with penguins is £12 which when I first saw the price I thought it was wrong as I expected it to be more. I also love the little boxes they come in, I have a strange obsession of keeping little boxes like this I never end up using them I just can never bring myself to throw it out. Anyway so that is choc-on-choc chocolates, I love them and I hope you do and will if you buy them. Don't forget to add check back later tonight for the Halloween competition I will be running. They almost look too good to eat!! They looks so yummy, I wouldn't want to eat them either.